First things first: carciofi (car-cho-fee!) are a big deal in Rome, highly anticipated and nearly revered, and judging by their appearance, they seem to know it, too. They're the most eye-catching veggie at the market, pure show-offs dressed up in emerald green and violet, all pretty and layered and flower-like, and now that I mention it, I'd take a bouquet of carciofi over roses any day (photographic evidence below). Our unapologetic-ally magnificent carciofo plays an important role in Roman cuisine and can be found all over menus in the Spring, whether fried whole until crispy and deeply golden alla giudia, tossed with fava beans and peas to make vignarola (more on that soon) or braised with herbs and garlic alla romana. Having said all this, I'll be honest here: while I'd like to tell you I fully assimilated in to Roman culture and cuisine upon arrival in the capital, immediately falling in love with the artichokes at my local outdoor market (romantic!) I didn't, up until a few years ago, really pay the Roman artichoke any mind (blasphemy!) While I very much liked eating them, I did so only when dining out, and kept it at that. After all, the beautiful carciofo was intimidating, kind of high maintenance (what do you expect from a supermodel veg,?) involving things like peeling and trimming and a sharp knife and spiky leaves and hairy chokes and to be honest, I wasn't all that interested. But with time I grew older, a little wiser, and decided to first dip my toe in the carciofo pool about two years ago, when I made these beauties here, and found that while artichokes did err on the side of tricky they were something I could make at home (!!!) They required lots of preparation, yes, and they didn't come out pristine and perfect, no, but the pay off was delicious, and that extra bit of effort made me feel proud and very chef-y as I trimmed and snapped away and fried and was left with a big bowl of purple-y leaves. I was officially converted, inducted in to the Carciofo Club, and have never looked back since. So! 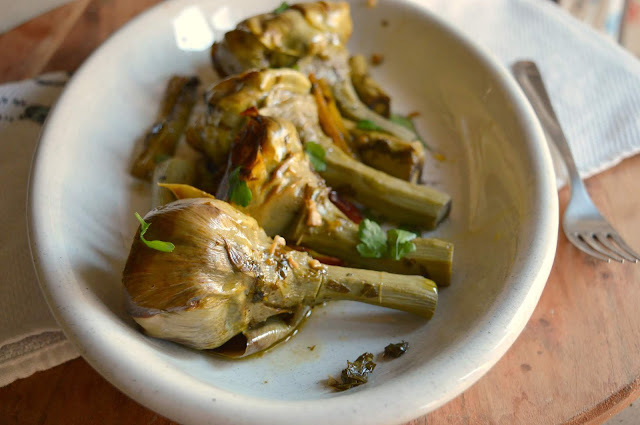 Here is the recipe for perhaps the most classic Roman artichoke recipe -- called carciofi alla romana, obviously -- which I recently made with Queen Carla Tomasi at Latteria Studio (this class here). As always, I got lots of helpful tips from Carla, this time on artichoke prep -- if only my precision and ease in prepping artichokes were as great as my enthusiasm for them! -- but preparation aside (practice makes perfect!) this recipe is downright simple, just requiring a few ingredients and half an hour in the pan, after which you will find yourself with: a pot of fork-tender and buttery carciofi (miles away from their former spiky selves) which have been braised in olive oil until the leaves are soft and lightly golden brown and steamed until the formidable stems are equally so, each one shining in all its artichoke-y splendor with just a little bite from the garlic and a bit of brightness from the parsley. **gazes off dreamily in to the distance**. Long story short, these are a true joy to eat, whether it be as an antipasto or a side dish or if you're me, for dinner, accompanied by some nice cheese and pomodori secchi and freshly baked bread. Make these asap and tell me grazie later. 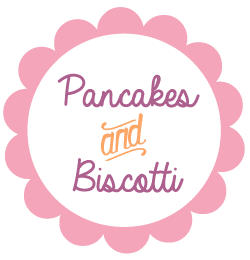 Looking for other Spring-y recipes? 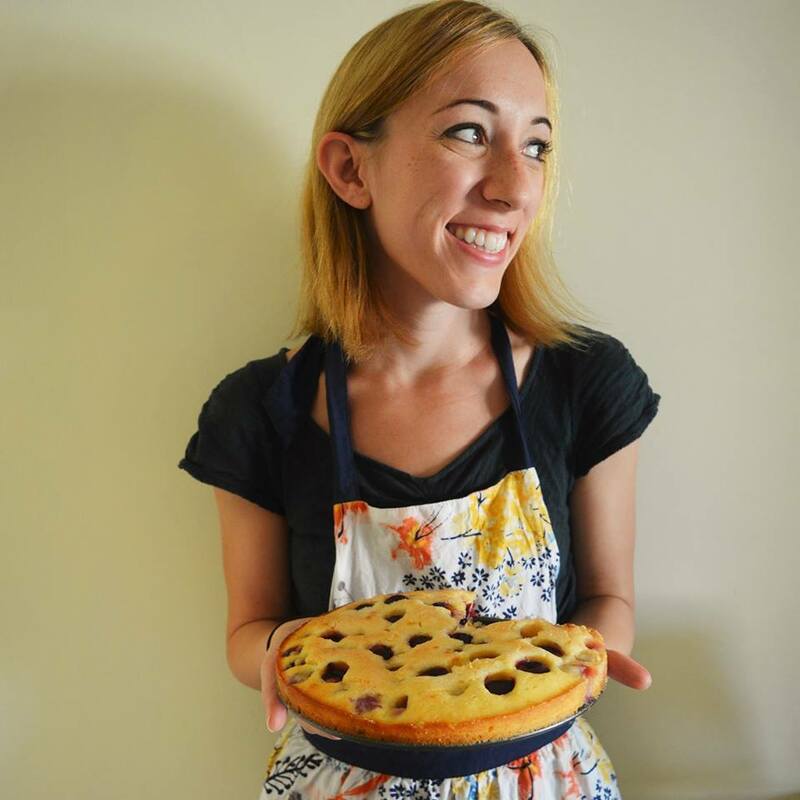 I've got these carciofi alla giudia, this pasta frittata with asparagus, this asparagus with burrata, this roasted asparagus pizza, this frittata con fave, pecorino, and pancetta, this panzanella primaverile, this pasta with fave and pecorino, and this torta pasqualina. 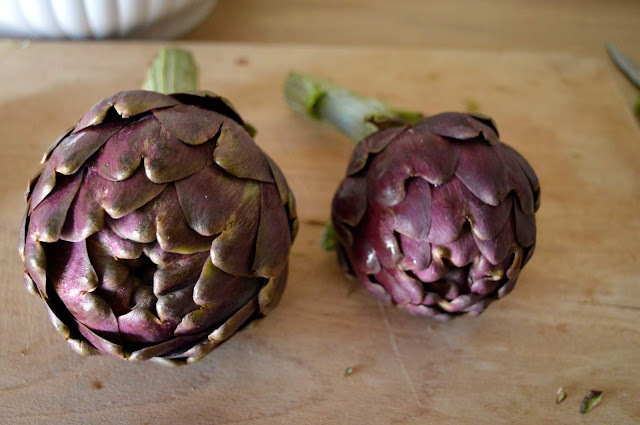 A couple of notes: You can add either wine or water to the artichokes when you braise them; note that you might need to add a little more liquid as necessary, so take the above-mentioned quantity as a suggestion. I have made these with both wine and water and have to say I prefer them with water, as it allows the artichoke flavor to shine a bit more. See what suits you however. I personally do not like fresh mint so have used parsley, but feel free to use whichever herb you like best. First, prepare your artichokes! Fill a large bowl with water, halve and squeeze 2 lemons into it, and set aside. Using a sharp knife, cut off top of artichoke and bottom most part of stem. Trim away fibrous outer layer of the stem (I use a vegetable peeler for this) and feel free to trim any longer stems; you can cook the stems with the artichokes (they're delicious). Next, work your way around the artichoke and remove the tough outer leaves to expose the tender inner leaves. Using a spoon, scrape out the inedible, hairy choke in the center of each heart. Lastly, use a sharp knife to cut off the bits of artichoke base remaining from where you removed the tough leaves. 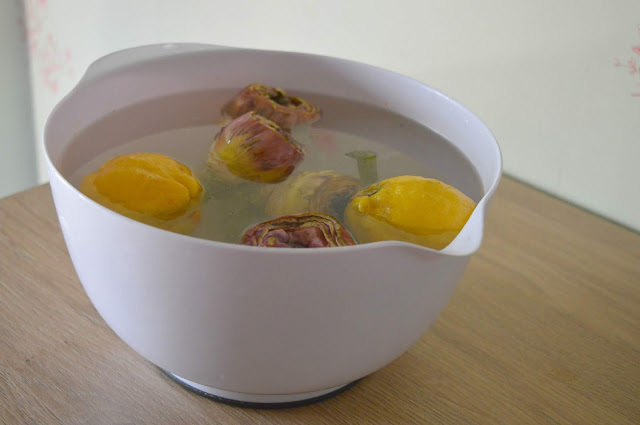 Transfer the cleaned artichokes to bowl of lemon water as you go. 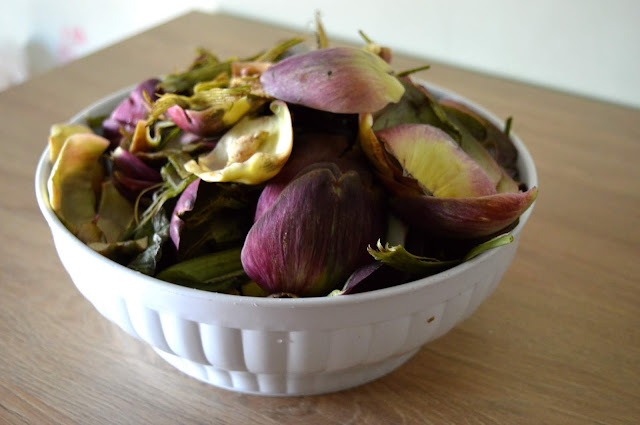 Having said all this: If you have any doubt about preparing artichokes, there are lots of YouTube tutorials, plus these excellent guidelines from Serious Eats found here, plus some step-by-step photos from my post on carciofi alla giudia. 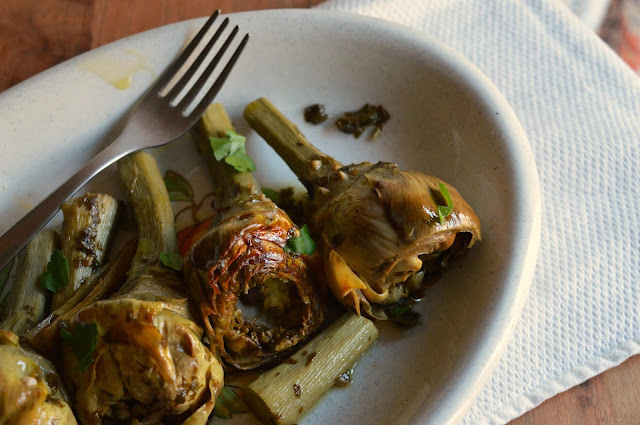 Note that this is a very Roman preparation of the artichoke, and is a little time consuming, but worth it; the resulting artichoke isn't as impressive as a big globe on the plate, but you can eat this one! Next, make your filling. Chop the garlic and set aside. 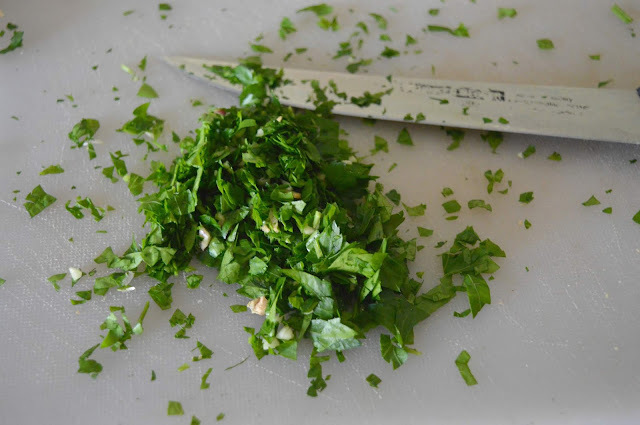 Roll up the bunch of parsley (or mint if you prefer) and roughly chop it, then using your knife, incorporate the garlic, a bit of salt, and a few grinds of pepper. Next, remove your artichokes from the lemon-y water, tap them on your cutting board a few times to remove any excess water and to open the leaves a bit, and stuff each with a bit of the parsley/garlic mixture. Place your stuffed artichokes in a large pot on the stove, placing them fairly close together. Pour in the olive oil and the water or the wine. 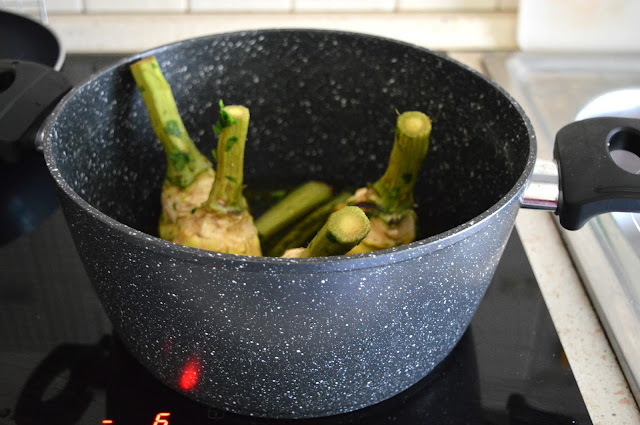 Cover the pot with a lid, if you have it, or cover them with a piece of parchment paper folded to close the top of the pot, thus allowing the artichokes to both steam and braise at the same time. Let your artichokes cook for about 25-30 minutes; they're done when a knife inserted in the thicket part of the artichoke stem goes through with no problems. Place on a platter, sprinkle with a little extra parsley, and enjoy.